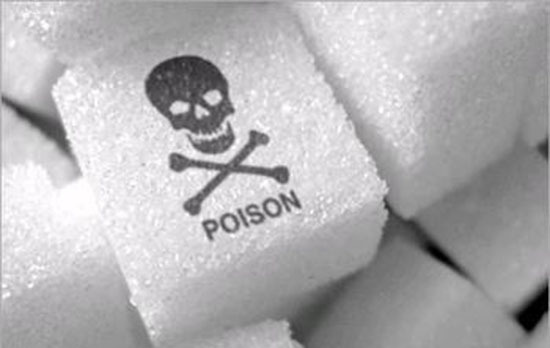 Sweet poison: America’s deadly sugar epidemic. There’s an epidemic among us, a white granular substance that’s taking over our lives and slowly eroding the fabric of health in this country. When ingested, it disrupts our body’s chemical and hormonal balance, promoting disease and causing a slew of health problems…and possibly even addiction or death. But we’re not talking about some illicit narcotic or dangerous substance sold in the shadows but our favorite added ingredient to our food, so much so that we have jars of it on restaurant tables and bags of it in our kitchens. We’re talking about sugar of course, and if you think the dangers are overblown, please read on. In fact, sugar is so harmful to our health that many medical and nutritional experts have called for it to be reclassified as a drug or a poison instead of a food, since it’s completely devoid of any proteins, minerals, vitamins, or nutritional benefits beyond empty calories. Sugar is literally killing is. According to the United States Department of Agriculture, the average American consumes about 150 to 170 pounds of refined sugars each year! 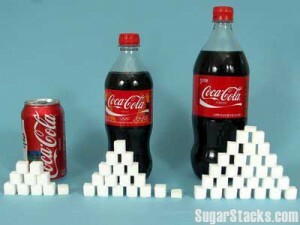 That means most of us consumer our whole body weight or more in sugar. Another way of thinking of it is that we’re single handedly downing 30-34 five-pound bags of refined sugar each, adding up to almost ½ pound per day. Eat a full teaspoon of sugar every 24 minutes every day of your life and now you have an idea of the average sugar intake. And if that’s not startling enough, remember that the average includes all of those folks who are health conscious and watch their sugar intake. So for every person that eats only 5 pounds of a sugar a year, someone else is eating a mind-boggling 295 pounds. 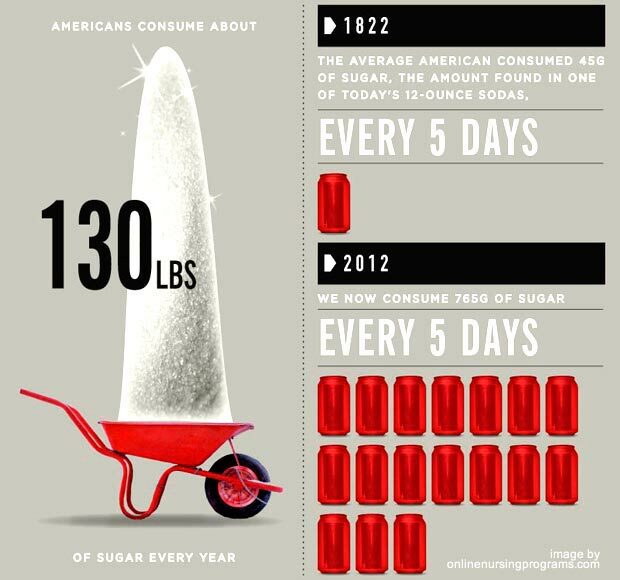 To put that in perspective, in the early 1900s, less than 100 years ago, we only ate 4 pounds of sugar per year on average. The ways sugar is damaging your health. Sugar intake actually compromises your immune system. Studies show that even drinking a couple sodas can stunt your body’s white blood cells from killing bacteria and germs in the body up to 40 to 50%, from half an hour after you consumer the sugar to around 5 hours later. Sugar is also causing our obesity epidemic. With all of that sugar intake, it’s also no surprise that obesity is one of the most prevalent medical problems in our country, despite all of our education, affluence, freedom to make choices, and exercise culture. Point blank, we think it’s fat that makes us fat but instead, the most significant factor is probably out refined sugar intake. Two out of three adults and one out of three children are now overweight or obese in America. Adolescent obesity rates have tripled in the past 30 years while childhood obesity rates have doubled. If something drastic doesn’t change, by 2030, it’s estimated that all 50 states will have obesity rates over 44%. Let that sink in. And we now spend an estimated $190 billion every year treating obesity-related health conditions, so imagine what the price tag will be then. But it’s not just the U.S. with this growing waistline problem. Around the world, obesity rates have doubled since 1980, as many other countries now eat processed and sugary foods. Now this is a bit of an oversimplification because it would take this whole article to document the relationship between sugar and obesity. But basically, it’s our high insulin levels that have a direct correlation to obesity, and sugar causes our insulin levels to spike, the same way trans fats and alcohol do. Insulin allows glucose – blood sugar – to enter the cells and trigger the response to start burning glucose, not fat. The problem with a diet high in sugars and trans fats is that our insulin stops working correctly and the cells become resistant to it, leading to a whole lot of mal effects. And don’t be confused by the fad diets and quack advice that try to scare you away from fruit. In moderation, the fructose from fruit is easily and properly metabolized, especially if you have an active lifestyle or after exercise, and there are also many nutritional benefits. We can blame it on the liquid candy. Sure, we eat far too much candy, ice cream, and donuts, but the real culprit is sugary drinks. Sodas, in particular, but also fruit juices, energy drinks, sweetened teas, blended coffees, and flavored milks are saturated with obscene levels of refined sugars (or high fructose corn syrups), and we drink a lot of them – especially our children. 50% of the U.S. population over 2 years old consumes sugary drinks on a daily basis, and that doesn’t even include fruit juices or teas, which would bring it much higher. In fact, U.S. children used to consume only 2% of their sugar and caloric intake from sugary drinks, but now that number is 11% or higher. As a nation, we’re soda-aholics, and the size and sugar content of the average soda sold in grocery stores, mini marts, fast food chains, and movie theaters keeps swelling past the size of even our normal cup holders. The average 12-ounce soda (one can) contains about 8 ounces of sugar, so four of those equal a quarter pound of sugar in our systems. And with the average soda drinker consuming at least 2 ½ sodas per day, and factoring in 200-700 calories PER SODA, we’re easily adding a couple pounds a week, and poisoning our bodies. The problem is so acute, that the American Heart Association estimated that sugary beverages cause well over 180,000 deaths each year. How do we cut sugar out of our diet? 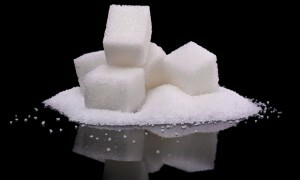 Some foods that are notorious for being high in sugar include cake, candy, chocolate, cookies, doughnuts, and ice cream. But you probably knew all of those, already. The scarier part is that many foods have huge amounts of added sugar, even if it’s not listed in the ingredients (look for “high-fructose corn syrup” instead of “sugar”.) Even some foods that advertise that they contain low or no sugar have the same detrimental health benefits! In fact, renowned endocrinologist Robert Lustig reports that 77% of food items in U.S. grocery stores contain added sugar, many of them for no apparent reason but to appeal to your addictive sweet tooth to get you buying more. Sugars and artificial sweeteners such as high fructose corn syrup are commonly added to barbecue sauces, breads, canned fruits, crackers, frozen dinners, hot dogs, ketchup, marinades, peanut bitter, pickles, salad dressings, soups, and vegetables. Do some research ahead of time what brands say they are sugar free and which ones actually are. Ban soda from your kitchen and meal times except for special occasions, and watch out for sugary fruit juices – water is the best alternative. Please contact us if you have any other questions or want more advice on staying healthy. Chiropractic care can help cure America’s prescription painkiller epidemic. 10 things that may be causing you to have low energy – and how to fix them!